2018 Dartmoor Bronx V.2 Chrome. Purchased when I had a dmr transition 26, ended up not liking it after a couple of rides so it ended up in the back of my closet. Fork has a few scuffs but very minimal. Steere tube is length is 7 3/8 inchs. Up for sale is a take-off 2009 Cannondale SuperSix Hi-Mod Tapered Carbon Fork. Used but in great condition. Light and stiff. Looking for $60 or best offer. Thanks. Steerer cut to 7”. Was on a large frame MTB. Very low miles. Excellent condition. Compression plug, bolt, and top cap included. What you see is what you get, uncut steerer. 100mm spacing, NOT BOOST, quick release. Accepting reasonable offers. 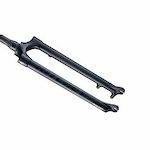 NINER RDO Rigid Carbon mountain bike Fork 29er Tapered 15x100mm thru axle. Condition is Used but great condition. Very little signs of use. Silver/black color. 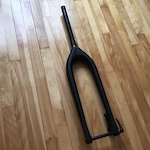 Steer tube is 7.5". 18.5" axle to crown.